Living in Florida is fantastic for my taste buds! The hot weather makes my family crave fresh fruit and veggies, and Florida delivers during every season, with delicious fresh produce. Florida Farmers make it so easy for everyone to eat fresh produce year around! Within a 5-mile radiance, there are over a dozen farmers markets held on various days of the week, Plus, my local grocery stores are always well stocked with products featuring the Fresh From Florida logo. 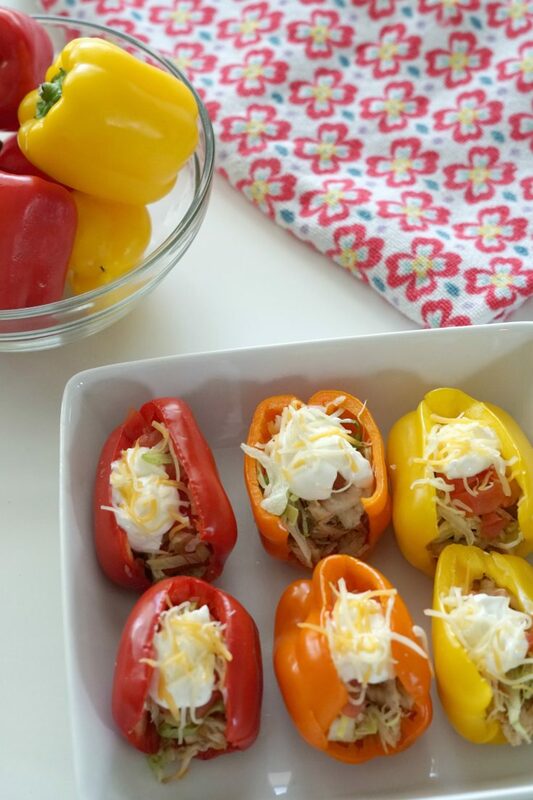 Like these delicious bell peppers! Fresh From Florida Bell Peppers, Squash, and Sweet Corn are Now In Season in Florida! In Florida, something delicious is always in season, and right now our favorite veggies are! 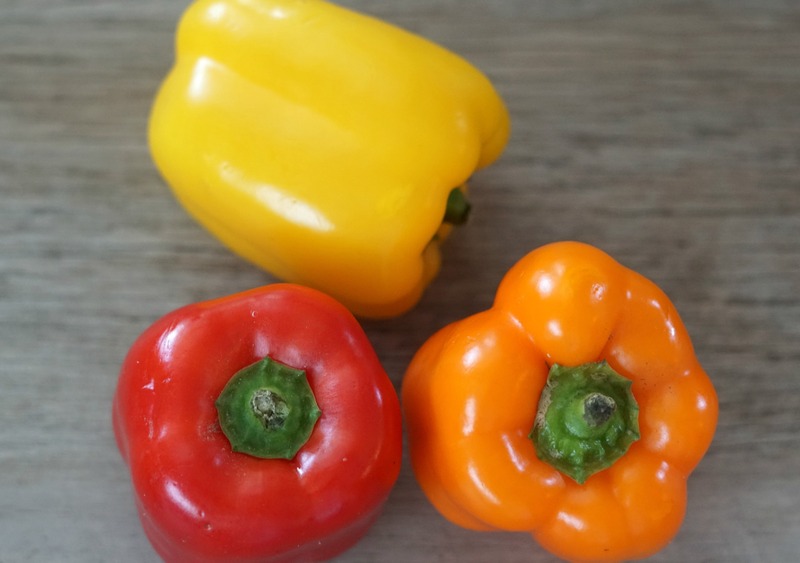 My family snacks on Bell Peppers daily, and I love to cook with them because they are so versatile, so we have stocked up on Fresh From Florida Bell Peppers. Squash and Sweet Corn are also in season in Florida, which makes me a very happy mommy because getting my kids to eat their vegetables is so much easier when I am serving up lots of their favorites. 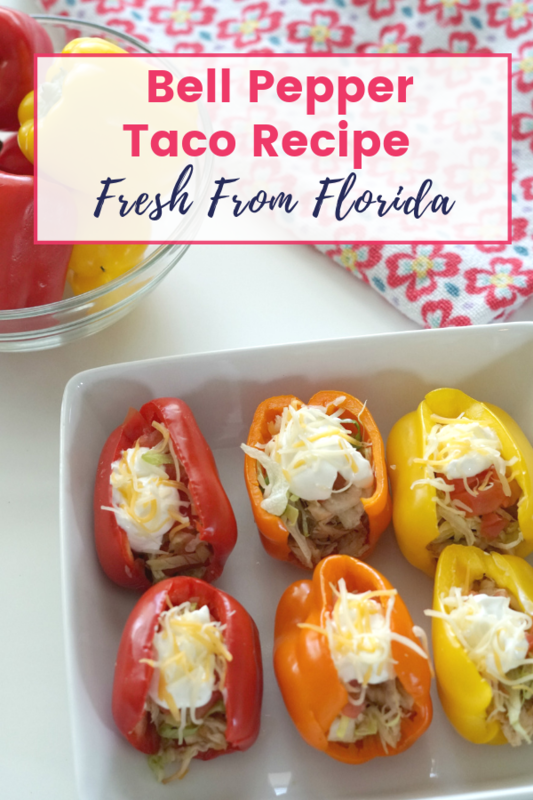 Are you looking for more great recipes incorporating Fresh From Florida foods? Make sure you visit their website for Fresh From Florida and to see what is currently in season. My family loves Tacos! We don’t just eat them on Tuesdays, we usually have them for dinner several times a week, so adding some twists to the average recipe is a must. For years we have been swapping out the beef for shredded chicken, pork, or seafood, and now we have started changing what we use for a shell as well. 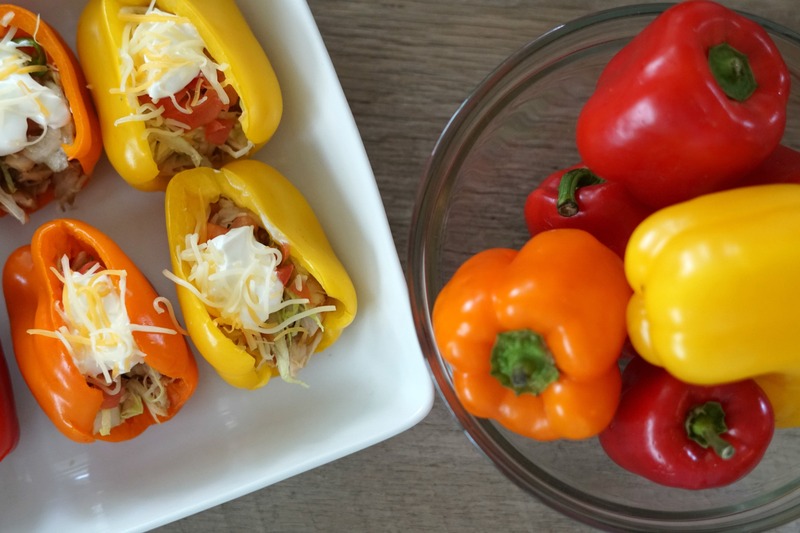 We gave Bell Peppers a try a few weeks ago when we heard they were in season, and the tacos were a huge hit at my dinner table! Start with baking your chicken breast until it is fully cooked. While the chicken is baking, mix the taco seasoning packet with the amount of water the packet calls for. Once the chicken is fully cooked remove the pan from the oven and pour the taco seasoning mix over the chicken. Place the chicken back in the oven for 10 more minutes. Next, remove the chicken from the oven, let it cool and then shred or chop it. While the chicken is cooking prepare your other taco ingredients. Dice up the tomato, chop the romaine lettuce, and prepare any additional veggies you may want to add to your taco like some sweet corn. After the taco stuffing is ready, it is time to create the taco shell out of the bell peppers! Cut each bell pepper around the stem and down the side of the pepper in a V-shape. The sidecut should be wide enough to fill the pepper but narrow enough that the sides keep the taco ingredients inside. Finally, fill the bell peppers with the ingredients as you wish. My bell pepper tacos are filled with chicken, lettuce, tomatoes, shredded cheese, and sour cream. 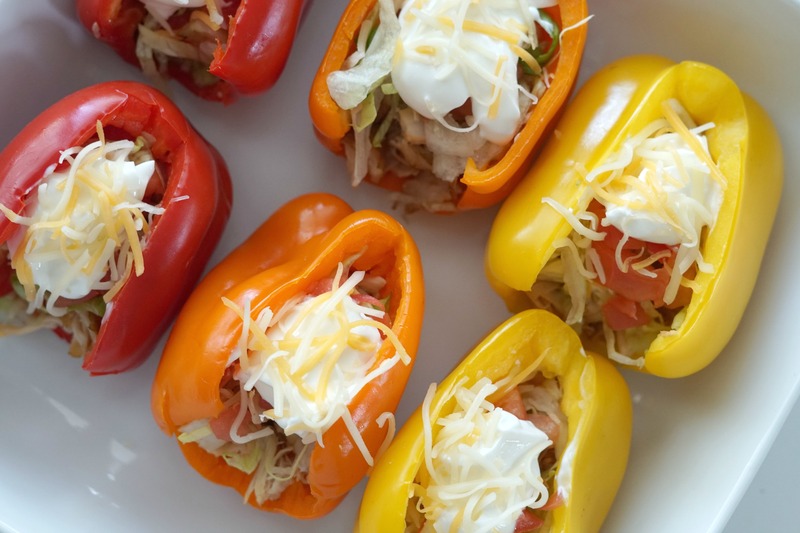 This recipe allows you to mix up the ingredients you love the most, my husband prefers to swap out the sour cream for ranch dressing and hot sauce. 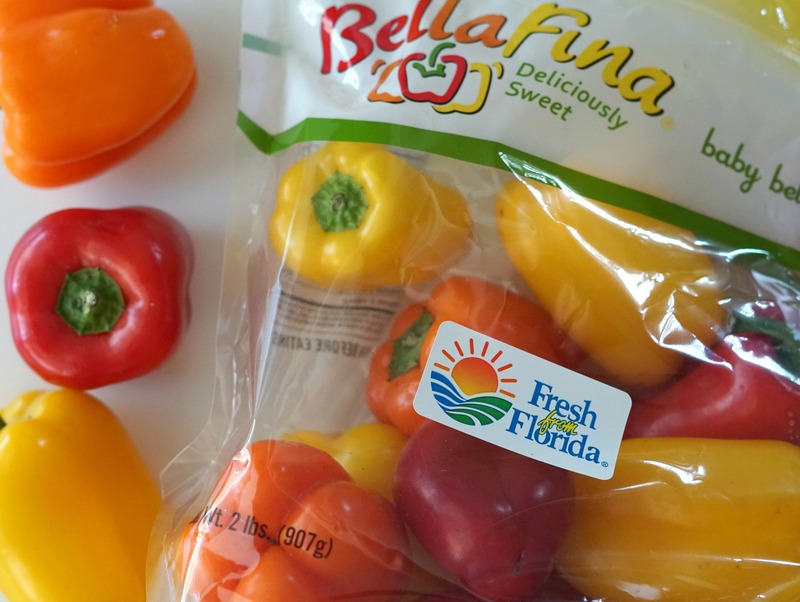 Plus Remember to always look for the Fresh From Florida Label when shopping for food, produce, seafood, and especially bell peppers! 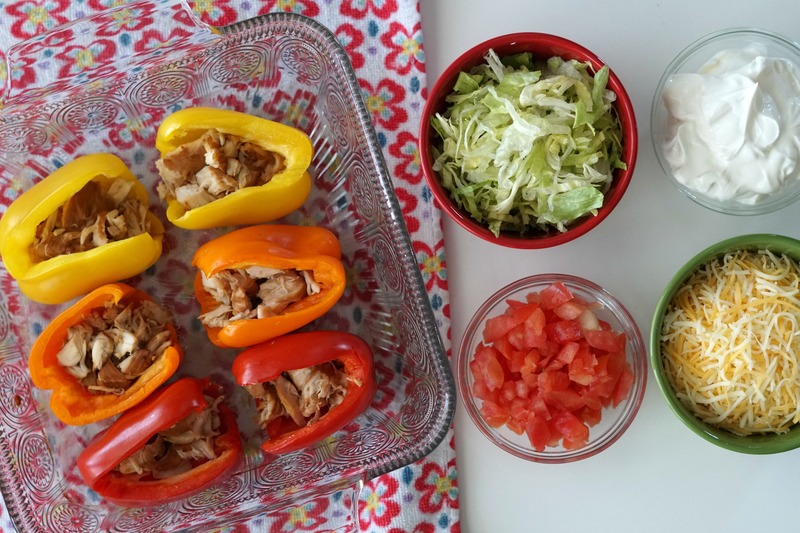 A twist on beloved family dinner, let's take Taco Tuesday to a new level with chicken Tacos and Bell Peppers. 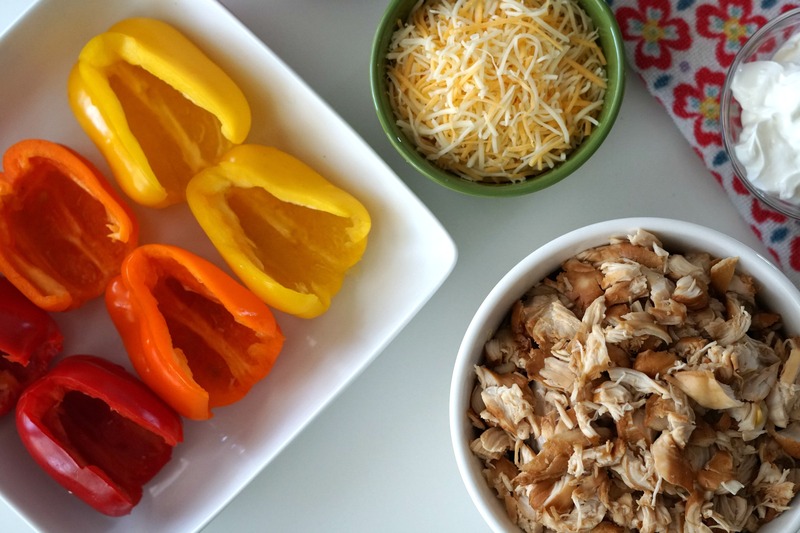 Bake chicken breast until it is fully cooked and while the chicken is baking, mix the taco seasoning packet with the amount of water the packet calls for. Once the chicken is fully cooked, remove it from the oven and cover it with the taco seasoning mix, place the pan back in the oven for 10 minutes. After 10 minutes, take the chicken out and allow it to cool before chopping or shredding it. Chop up Romain Lettuce and Dice the tomato. Now, that the taco stuffing is ready, cut each bell pepper around the stem and down the side of the pepper in a V-shape. The side cut should be wide enough to fill the pepper but narrow enought that the sides keep the taco ingredients inside. Finally fill the bell peppers with the ingredients as you wish. My bell pepper tacos are filled with chicken, lettuce, tomatoes, shredded cheese, and sour cream. Previous Post: « The LEGO Movie World at LEGOLAND Florida is Now OPEN! This looks so fresh and healthy. I love it and am try it out over the weekend. This is perfect! 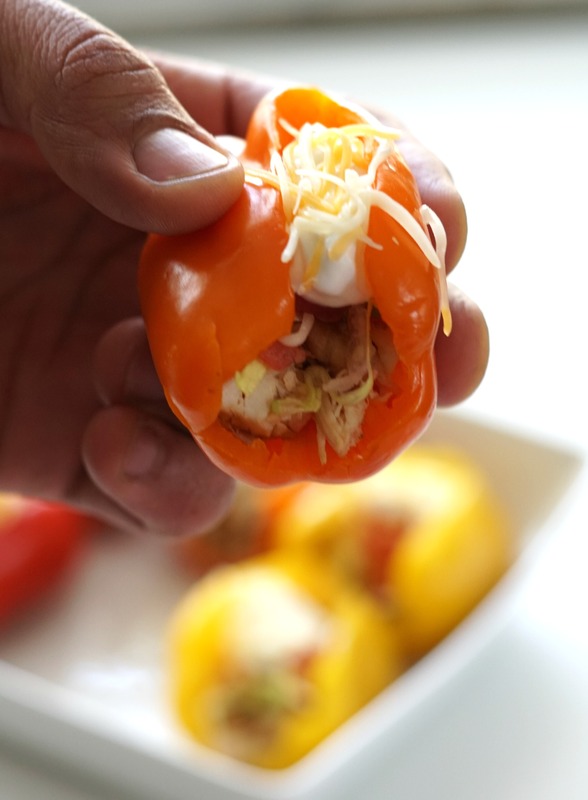 I love playing around with bell peppers for good recipes. Adding it to my list to try. I super love the idea. So creative and it is healthier than the actual tacos. Thanks a lot. Omg i love this!! 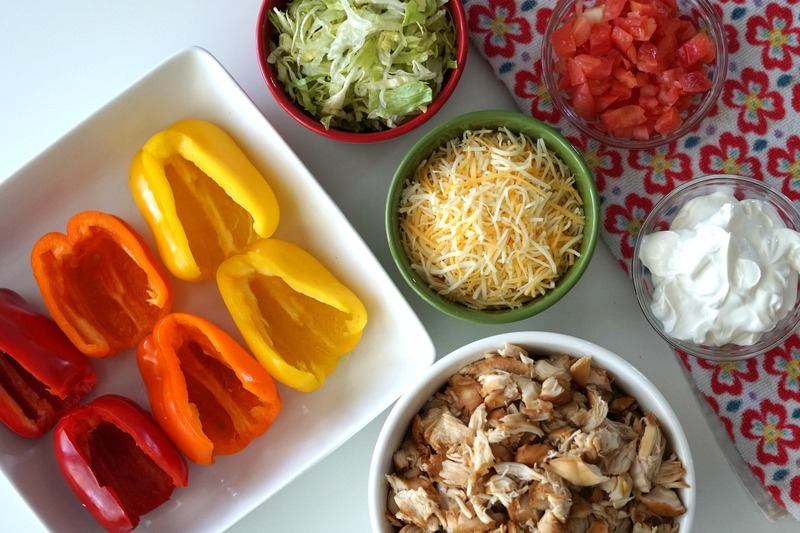 I actually want to try this at home, looks so good especially i love healthy peppers and tacos! Thank you for the easy recipe! This recipe looks so good. Adding this to our dinner rotation menu! I love your different way of making tacos, its easy and delicious. I am going to make this tacos recipe at home. What a tasty dinner idea! These would definitely be a popular choice for a meal in my household. 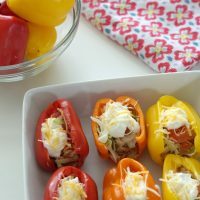 I love this twist on traditional stuffed peppers! I am starting low carb this week so this is currently being added to my rotation. Thank you!